Many people living in apartments have the benefit of a covered parking spot, known as a carport. Not quite a garage, as it is open on three or four sides, a carport still helps to protect your automobile from the elements. It gives you a dry place to exit the car during the wet months, and a place to park your car in the shade during the hot months. With real estate at a premium, and storage space almost nonexistent in a lot of homes, most already standing garages are filled to the top with extra stuff. Things like the kids’ school papers, old sporting equipment, fishing gear, holiday decorations and similar. And if it has not been filled with boxes, it has likely been converted into more living space like a games room for the kids, a man cave for dad, or perhaps a home gym to get fit without leaving the kids alone. The carport price is easier to handle as well, since they tend to be far more affordable than a garage, especially when building on to an existing home. If a carport sounds like an option for you and your home, you can hire a carport builder to build a carport Perth for you. However, because every property is different, having a carport built should not be a one-size-fits-all solution, and should instead be handled on a case-by-case basis. Don’t just purchase a carport kit and build a carport yourself. You need to find someone who has experience in building these structures, and who can take into account all the considerations of your current home and the property upon which it will stand. A garage that can be locked will likely always be more secure than a carport, but that does not mean your carport is not a safe haven for your car. A carport can be a safe structure, so long as it is built properly by experienced carport builders. A steel carport poses fewer risks than does a timber one, but as long as the carport has been solidly constructed, there should be no need for concern. There are many things you can do to safely store your car in your carport, and the first of these is to actually lock your car’s doors. Too many people think that they live in a good area and nothing bad will ever happen to them, and unfortunately, many of these people are wrong. It seems as though more car burglaries are being reported on the news each day, and a lot of the victims simply forgot to lock the car. You can also add specialised lighting to your carport that turns on when they sense motion. This motion could be from an animal passing in the night, or from a criminal trying to break into your car. Either way, a motion sensing light will likely scare away either intruder, and if it doesn’t, it will at least make them highly visible to neighbours or other passing cars. No criminal wants to be in the spotlight while committing a crime, so motion-detecting lights are a great deterrent for your carport. Be sure to consider adding video security systems as well. You can often set these systems up in a way that allows them record continuously, or to only record when they sense motion. The system can alert you, if necessary, through an installed alarm or an app on your mobile. To further protect other valuable items on the carport, make sure they are stored in locked chests or chained down in some way that will deter a thief from making off with it. You can store extra sporting gear and tools inside locked chests and consider chaining lawnmowers and trimmers to poles or other areas from which they’d be hard to remove. Perhaps you have the space and money to allow for adding a gate to your property, which would allow you to close off access to any unwanted person or intruder. Your carport does not have to be a place where you can become a victim of theft. Think through the things a thief might try to take and consider how to make it more difficult for them to take them. Since you are looking into adding a carport to your property, we can assume you plan to store a car or another vehicle such as a motorcycle or a boat inside the structure. After all, that is the general purpose of carports is it not? We know that storage space is hard to come by in Perth, and that is why many homeowners give up that space in their garage in order to gain more space to store things. Well, adding a carport can also free up some space to store things. You can enclose a side or two and add shelving along the walls. This will give you space to store away extra things that there is no room for inside the house. Just be sure you have a way to lock up important things so perhaps locking cabinets or drawers would suffice? Because you are looking to hire a carport builder who will customize your carport, you can let them know that you want storage space included in the design and the carport price. Many carport builders are happy to work with you through the full process of getting your carport built. During the early stages, you can work together to design a carport that leaves ample room for storing your car while also allowing plenty of space for storing the kids’ outdoor toys and your camping and hiking gear as well as the holiday decorations your partner refuses to part with. There are many storage options for you when you build a carport yourself with a carport builder in Perth. You might be under the impression there is no way to guarantee privacy whilst being parked in a carport, as there are generally no walls on three or four sides. That can be true, but there are options for providing privacy in these structures as well. When designing a carport with a carport Perth builder, you have the ability to have it done exactly the way you want it to be done. You can choose how large it will be, how it will look, the colors, the roof style, and how it will match the design elements of your home. You can also determine how you want to add elements of privacy to the carport as well. Perhaps you would like to enclose a side or two. The Building Code of Australia states that a carport must be open on at least two sides, so it allows for at least partial ventilation. This is a decision that has been left to your local council though, so be sure to consult them on the matter. Partially enclosing your carport can be a great option for several reasons such as security and storage as discussed above, but it is not always a practical solution. Sometimes the carport cost is too high, and you can’t add more on, or perhaps your local council will not allow for the sides to be enclosed at all. Whatever the reason, do not be dismayed. You can still get the privacy you seek. Outdoor blinds can provide privacy while also providing additional shade for your car. You can often purchase these blinds in a variety of colors, allowing for more customization. You can erect a privacy screen along a side or two of your carport. These too will provide more shade for your car as well as provide a way to keep prying eyes from seeing what is in your carport. This gives you more privacy and security for your belongings. If you like landscaping options, you could choose to plant some shrubs alongside the drive into the carport, or maybe some climbing vines up the sides of the carport. This would allow for privacy and shade without physically enclosing the carport, and it would also be a beautiful natural addition to the outside of your home. There are many options for adding privacy to your carport, and not all of them involve more money spent or more laboring over work being done. Every house should have a carport for storage, for privacy and for more space. Having a carport built on to your current home can increase the curb appeal down the road, as long as it is done well. Buying a cheaply made kit and sticking it up yourself is not the best course of action here. You need to work with a builder who has a team of staff that knows how to make this carport look like it was always there. No one likes the look of a disjointed house that appears to have been thrown together over the years, and a carport should not look like this either. A carport builder should work to ensure that the carport you build complements the appearance of your home whether it is traditional or contemporary by design. Look to find a local builder of carports in Perth, so you have someone on your side that understands the local weather and topography as well as the local council’s building regulations. You can have a nice new place to store your car before the wet season begins. Are Custom Patios Worth the Investment in Perth? A custom outdoor patio can be well worth the investment in many different ways. Not only will it pay off to you while you live in the house, but it will also pay off during the selling process. In fact, if you are looking for a way to increase the value of your home, building a patio is one of the highest recommended options. Patios have been ranked as one of the top ten features buyers are looking for when shopping for a new house. In addition, over half of buyers said that they would be willing to pay a premium price on a house that includes a patio. If that alone is not enough to convince you that a custom outdoor patio is worth the investment, we’ve done our research to help convince you more easily of this. Understanding that a patio could increase the value of your home is not the same as it being a worthwhile investment, so let’s break down the two major benefits that a patio provides, which together add up to a greater value than the cost of building it. Having a patio makes a great excuse to spend more time outside. Spending more time like this outside is good for mental health and overall wellbeing. It can improve your mood and improve your life drastically. Spending your morning drinking coffee and reading the newspaper outside could be one way to utilise the space. You could also take a book outside to the patio in the evenings. Having a relaxing covered outdoor space could also mean you parents can spend time watching your children play in the backyard instead of having them glued to a video game or smartphone in the after-school afternoons. Building a custom patio with a covering will also encourage time spent outdoors when otherwise the weather would not permit it. Sitting outside listening to the rain can be quite relaxing, but that’s not possible to do whilst remaining dry without a covered patio. A covered patio means you don’t have to call off your barbecue dinner party when there’s a drizzle going on. It also means you have a relaxing and safe space to breathe in fresh air and enjoy the great outdoors from the comfort of your own home. Whatever your life looks like, there will be an important use for your custom-built patio. For example, if you have a stressful job and find that you are somehow always busy or on the go, decompressing might be an important component of your life off the clock. If you are struggling to find the right way or space to decompress fully, perhaps an outdoor patio could be that for you. On the other hand, maybe you are a social butterfly who is always planning the next get together for you and your friends. You love groups and parties and want a way to bring the fun times to your house without totally disturbing your home space or overcrowding the kitchen. An outdoor patio could be the happy medium for you: a place for an outdoor barbecue and hot tub to host friends for dinner parties under the night sky. Customising the patio with a beautiful roof will keep you guys dry and protected from any weather, and you won’t have to worry about lack of indoor space. Any old patio might not add value to your home or pay off with benefits in the long run. It’s important while you’re customising the patio that you build one that will pay off and increase what your home has to offer. If you have a huge yard, a small patio might look dinky. On the other hand, a small yard with a large patio will look silly or congested. The lack of green space it would leave would actually decrease the value of your home. Finding a proportional size for your patio in comparison to the rest of your yard will be the sweet spot of both added value and an enjoyable investment. Another thing to be careful of if you want a patio that truly is a worthwhile investment is not agreeing to a stand-alone structured patio. You want a covered entry from the house so that access is protected and easy. It should be strategically located in front of a door to the back yard. If you don’t have a door in that position, you might want to consider adding one as well. If you have yard space and a door on the side of your property, you might be tempted just to build out your custom patio on the side. While you might be close and comfortable with your neighbours, any new buyers might not want to be that close. Keep patios for the backyard to ensure longevity of the investment. Most importantly, finding the right company to invest in means you will have builders that will invest in you. They will want the best for your new custom patio and home value. That’s what we at Platinum Outdoors are all about. If you have any questions or are ready to begin your journey to a custom outdoor patio, give us a call. If you are considering an outdoor patio, the chances are high that there is one particular reason strongly drawing you towards the possibility. Whether that reason is for the value, the leisure, or the entertainment, you may not be aware of the plethora of other reasons that make having an outdoor patio in Perth a fantastic idea. 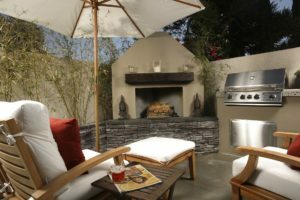 Just to give you the full and entire scope, we have rounded up all the best benefits we could come up with that may help you make up your mind to go ahead and start building that outdoor patio of your dreams. A covered outdoor patio can add so much value to a home that previously had no such outdoor space. While it may be quite the investment up front and those numbers might scare you, you have to consider the payoff. When you decide it is time to finally sell your home, an outdoor patio can up your selling price more than you know. Buyers know how convenient and usable an outdoor living space is, and it’s a highly attractive feature when they are looking at tons and tons of houses with not much to help them stand out from each other. Depending on how you design and stage your outdoor patio, it can turn into quite the entertainment space. For example, consider installing an outdoor kitchen area on the patio. If you are someone who likes to bring the party to your own house, your outdoor kitchen and living space is the perfect place to host a small crowd. In the warmer months, you could cook on your outdoor grill while your guests relax on benches or chairs and enjoy the summer air. If entertaining is not really your thing, maybe lounging is. An outdoor patio can serve as the perfect reading nook, resting area, or hang-out spot for the whole family. The options are endless; it just depends on how you want to fill the space. Add a hot tub to create the ultimate relaxation space. Finding a large round table could make your outdoor patio the perfect spot for a family game night. A barbecue means more outdoor dinners. The aspect of leisure is ingrained into the nature of an outdoor patio, but the specific use can be customised for your needs and desires. It would be fair to argue that most of the above reasons could still be accomplished with a paved but uncovered patio. While that’s true, the covered outdoor patio provides a protection unique to itself. Having a cover over your patio space protects the furniture and equipment you have invested in and put in this space. It’s no fun to buy new patio furniture after every storm. An extra safeguard, the roofing aspect will allow you to sit outside and listen to the rain or keep your grill safe from pelting hail. Preserving the patio space will protect the value of it and your home. While bad weather is inevitable, it doesn’t have to put a damper on your leisure. Even on days when the weather isn’t perfect, your favourite little outdoor spot still will be. It’s easy to get caught up in staying warm and cosy inside on your couch. During winter or rainy months, staying inside so much can actually cause seasonal depression. Not only is spending time outdoors good for your mood and mental health, the sun can also provide important Vitamin D to you. When you know you have a protected outdoor space at your home, you will be more likely to spend time there. Instead of reading in bed, you may find yourself inclined to read on the patio as the sun sets. Perhaps your morning routine will turn into coffee in your robe on the patio while reading the newspaper instead of rushing to get ready and run out the door to work. More time outdoors is great for children, too. In today’s world, children are bombarded by digital screens and indoor technology. What happened to the days of playing with friends outside or spending time on an outdoor swing set? An outdoor patio could give all you parents a place to relax while watching your children play in the backyard. Maybe they could even convince you to get that swing set after all. Hopefully this roundup of reasons will help you go for it in deciding to build an outdoor patio. If you’re ready to take the plunge and are looking for the right company to get the job done, look no further. At Platinum Outdoors, we can work with you to create an outdoor living space to satisfy your vision. What Should You Consider When Hiring Alfresco Builders in Perth? 1. Creating a complete list of options. esco companies there are in Perth. At this stage there are no strict qualifications to consider before adding anyone to the list. If they provide what you’re looking for, they have made it past step one. 2. Researching the most important aspects of each long-list option. Whilst doing in-depth research at this stage would be exhaustive and unnecessary, doing a bit of skimming research will help to narrow down the list to a higher-quality selection of businesses to choose from. The most important things to immediately consider when weeding out the crowd includes reputation, portfolio, and services. Reputation deals with customer reviews, ratings and testimonials. The company website is a great place to start, but prepare to see mostly positive information. Of course, a building company will not post negative testimonials on its site. Look on Facebook for guest reviews or on sites where the company cannot control the feedback. Take it a step further. Ask around to people you know for their honest opinion on the company. Even if they haven’t used them before, they may know someone who has. There’s no better source than a former customer. On the company’s site, they should provide a portfolio of previous work. Taking a quick look at the quality and style of previous projects will help you get a general understanding if the work they do is what you’re looking for. It’s absolutely key to make sure the companies offer the kind of work you are looking to get done. If they don’t have it listed on their site as an offered service, go ahead and cross them off. You don’t want to hire someone to do a job for you they have no experience doing. 3. Narrowing down the list and giving the short-list options a call. Once you’ve dwindled the list down quite a bit, go ahead and give the companies that are still standing a call. Consider their customer service and how quickly and well they answer your questions. Ask to set up an interview with the most promising companies to speak about a project you’re starting. 4. Interviewing and getting competitive bids. Here begins the most important part of the process. During the interview, ask a list of prepared questions that will help determine if they can take on your project with success. Things to ask about include whether they have taken on a similar project in the past, how many projects they are actively working on at the same time, a list of past client references, and a list of financial references. If the interview is going well, you can steer the conversation towards a competitive bid from the company. Getting bids from a few builders will help you know how much you should be paying for your project. Once you’ve received all the bids you are interested in, compare them. Compare the included scope of work, completion dates, warranties, and quality of materials to be used. 5. Making your final decision on alfresco builders in Perth. Once you’ve done a side by side comparison of the best bids, you can determine which bid offers you the most and will satisfy your building needs. At Platinum Outdoors, we always strive to meet your alfresco building needs in Perth. If after all of these steps your options aren’t aligning with what you hoped, give us a call and we can make your outdoor patio dreams come true. It’s all too easy to overlook wood and what it can do for the outside of your home, rather than in terms of furniture like dining tables and chairs that you’ll normally find on the inside. We have a tendency to disregard it in favour of steel, stone and concrete because they are recognised as long-lasting, and better able to withstand the seasons. But as long as it’s treated with agents to keep it from rotting in the elements and all they have to throw at it, wood can be just as good for improving the outdoor aesthetic of your home as much as it does on the inside. It can help add a whole new dimension to how you view your outdoor spaces. As long as you hire a forward-thinking builder and designer to work on whichever project you decide to undertake, you shouldn’t have too much trouble in transforming some of your outdoor living spaces with timber. When ‘Neighbours’ became a British phenomenon in the late 1980s, one of the things that they found so fascinating about people in the Northern hemisphere was the attitude people have towards eating outside. This was always going to be the case; it’s much easier to do it in fictional Erinsborough where the sun is always shining rather than real-life Manchester where it always rains! Our ways of outdoor living on our outdoor patios are key to our country’s belief in having a good time, so you’ll want the setting to be right. Get the right alfresco builders in Perth to do the job and you’ll have a fantastic space in which to entertain friends and family for years to come. There are cedar-lined patios and other timber patios to choose from, or you can make it all about you by designing your own custom patio. Express yourself and your aesthetic creativity freely with a design that matches the elegant class of the rest of your home, and with that extension to your living space you’ll enjoy the benefits that come with it. It can have play as much, or as little a part in your home life as you choose. Awnings will all keep you safely in the shade when the sun roars at its hottest – just think of how jealous they’d be in soggy old Britain! Despite our love of all things outdoors, there are of course times when the weather turns and you need to protect things that can’t be taken into the house. Your car, for instance. 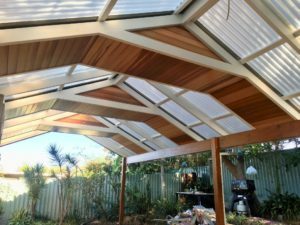 A timber carport in Perth could be just what you need to guard your motor from a thunderstorm when the rainy season hits, or from the unforgiving sun in the summer. It’s not as enclosed as a garage which allows for a certain degree of ventilation, but it acts as a vital first line of defence from whatever might fall – or shine – through the sky. These strong and stable structures keep your windows and windscreens clear from the might of Mother Nature, and in colder climates unlike our milder winters, they even keep frost off windscreens. A simple carport can therefore be a vital tool in keeping your car on the road. Like a patio, alfresco decking in Perth is the ideal place to put a table and some chairs and to entertain large groups of friends or your family, or to surround your swimming pool to give it the appearance of a cool, classy holiday resort. It gets its name, not unnaturally, from looking like the deck of a ship. It’s kind to bare feet, unlike the concrete of a patio, and it extends your house’s living area outside beautifully. Imagine if you have French doors opening onto a beautifully-decked area. It would be like a whole extension to the room! There’s also the opportunity to think fourth-dimensionally about decking. It doesn’t just have to extend from the inside of your home to the outside by way of your garden. If you have a door that leads onto a roof terrace or balcony, why not lay decking there too? ‘Up on the roof’ could be your sanctuary or cocoon away from the world. And that’s another plus point about timber decking – it needn’t be all about being the life and soul of the party. Instead of being the host with the most, why not put a sun lounger on it, wherever you choose to position the timber, and take in the rays with a book or your music player? Now that you’ve had a chance to see what you can do to transform your outdoor areas using wood, why not use the Platinum Outdoors website to formulate a plan? The possibilities there are certainly very tempting if you seek to add value to your home with a wood-based feature that makes outdoor living in Perth a pleasure. Potential buyers will always note these stand out features and it boosts the perceived value of your home. You have an opportunity to make your home more popular when the time comes to sell it – and all though making the outdoors that elusive extra room that doesn’t cost as much as an extension made from bricks and mortar. The transformation to the feeling of your entire home following such a simple piece of renovation work will be a revelation. Being outside not only makes us feel better, it has a number of health benefits, but sadly outside of the summer months we don’t always spend enough time in our gardens. Many of us spend a lot of time making our garden look great, and then it gets ignored for most of the year while we sit inside. However, there are ways that you can turn the garden into an additional living space, so it feels more like part of the house. 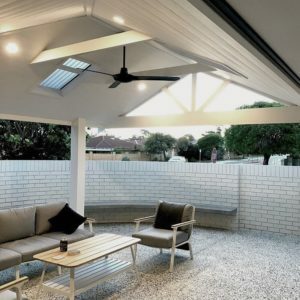 By consulting with alfresco builders in Perth, you’ll find there are many ways you can enjoy the outdoors all year round, from building shelters to patio heaters. Here’s how you can create additional living space in your garden. Creating a zone in your garden for relaxing or dining will help you make the most of the space. Many of us have areas of the garden that aren’t used, or are cluttered with junk, so clearing some space that you earmark as a living zone will help you make a plan. If you get stuck, it’s worth speaking to alfresco builders in Perth who’ll be able to help you come up with a design. Outdoor living areas often work best if they’re attached to the house, as this means a better flow into the garden. What can be achieved will depend on your budget and the amount of space available, but there are always options. Look for style inspiration such as alfresco patios in Perth, and see what your neighbours have done with their space to help you decide what to choose. While it’s easy to think about designing an alfresco space in summer when it’s lovely and sunny, it’s important to think about how things will hold up in winter. While winters in Perth and Western Australia are usually mild, there can certainly be frosty points, and the rainy season can also put a stop to going alfresco in Perth. However, by adding shelter from the rain, and maybe accessories such as a heater, you can enjoy the outdoors for most of the year. If you’re planning to have furniture in uncovered areas, make sure it’s suitable for outdoor use, and that you have somewhere to store it during the wettest time of year. From sunbathing to reading a book, there’s lots you can do in an outdoor living area. One of the easiest ways to enjoy the outdoors, it can be as simple as adding decking in Perth to your home. If you have French doors that open onto your decking or patio, it’ll feel like an extension of your living room. However, you’ll probably want some sort of shelter, as sitting directly in the sun can be uncomfortable. Adding an awning or permanent gazebo is a great solution to make it feel more like a living space. You can even add a ceiling fan to cool you down on the hottest days of the year. Another popular style is the outdoor kitchen, which is great not only for those who like to BBQ, but also those who regularly entertain. The great thing about outdoor living in Perth is that you have so much more space. It’s easy to organise a get-together, and an outdoor kitchen can have a built-in BBQ, worktops, storage, fridges, and much more, essentially giving you a second kitchen. Because the area is sheltered, it means you can have a BBQ all-year round too, whether it’s baking hot or raining, and you don’t have to worry about sudden gusts of wind. Meals are much more fun when you can enjoy the outdoors. If you don’t spend enough time in your garden, then creating an alfresco dining area helps you get more fresh air. How open the space is depends on you. Some people add timber patios in Perth in a shady spot, and then simply add a few features such as garden furniture to create a dining space. Others prefer to have a more permanent shelter, which means they can enjoy the space more often and don’t have to worry about changing weather. An alfresco dining space can be attached to an outdoor kitchen, and features such as patio heaters can be added to keep it comfortable even on chilly nights. Adding some basics such as outdoor lighting also makes it easier to use the space, and you can have the space designed in a style to suit you. The finishing touch should be your outdoor furniture. It’s important that you choose items that are hardwearing, and have weather-resistant finishes. It’s worth spending a little more on items such as garden tables which will be used for many years. You can even get outdoor soft furnishings to use on your patio in Perth, usually made of water-resistant material, which can be removed from the furniture when there’s a downpour. From reclining chairs to outdoor sofas, there are lots of style options available. If you want more space to relax and entertain, consider transforming your outdoor space. With 300 sunny days a year, outdoor living in Perth will help you make the most of your garden. No longer just a place for the kids to play and plants to grow, alfresco living turns your garden into part of your home. Whether it’s enjoying a family dinner, or lounging and enjoying a few drinks with friends, there are many ways that your garden can be enjoyed all year round. From a simple patio, to a full shelter, there are options to suit every budget and even small gardens can be transformed. When it comes to living alfresco, Perth is lucky enough to enjoy one of the best climates anywhere in the world for relaxing and entertaining outside. Because of the 300 days of sunshine a year we can depend on, it makes sense to spend some time and effort making sure our patios are the natural bridge between our house and our garden. Whatever your taste or budget, there are lots of simple yet effective ways of transforming your patio into a stunning, functional and comfortable outdoor living space. Every Perth patio is a lovely place to relax with a glass of wine when the sun has gone down and the heat has gone out of the day. What’s more, if you get your outdoor lighting right, this is when your patio really does start to feel like a fantastic outdoor extension of your indoor space. If your patio is covered, installing a ceiling-mounted light will make the most of this feature and illuminate all your alfresco meals and evening reading. If not, try using wall-mounted lights with motion sensors to make sure you get the light you need each time you step outside. Alternatively, hanging a statement lamp over your patio table will provide the perfect lighting solution for alfresco meals with friends and family. And don’t forget the year-round appeal of twinkling fairy lights and candles. If you’ve got kids running around or are looking for a practical, wind-proof lighting solution, why not invest in some LED candle lights to create a romantic atmosphere? Whether you have stone slabs or decking, Perth outdoor living spaces are always hugely enhanced by the addition of greenery. If you’re a keen gardener with time on your hands, you can really go to town with your patio planting, however for a hassle-free, low-maintenance solution potted plants are the way to go. Choose pots to suit your colour scheme and make sure you pick the correct potting mix for your chosen plant. Grasses tend to be a great low-maintenance choice but it’s best to talk to the staff at your local garden centre about your own specific needs in terms of space, shade and the time you can spare to tend your plants. And don’t forget that it’s important to choose wisely if you don’t want to actively attract unwelcome guests to your outdoor gatherings in the form of insects! When it comes to outdoor living Perth offers many ways to enjoy the outdoors in the comfort of your own home. Keen cooks with big families will require a large table to host their alfresco dinner parties, whereas singles or couples with a small space may prioritise a couple of sun loungers to relax on with a drink and a good book at the weekend. Again, when furnishing your patio, it’s important to think about how much space you have and what you want to do with it. If space isn’t an issue and you envisage your patio as being the hub of family life then it’s worthwhile creating a comfortable ‘living-room’ area away from the dining area complete with a garden sofa set and coffee table. When designing custom patios there’s a real need for protection from the sun in WA. After all, there is no point in creating a fantastic outdoor living area that is just too hot and uncomfortable to sit in most of the time. This is particularly true if you’re planning to eat outdoors on a regular basis. Timber or aluminium-framed covered patios are a stunning addition to your home that will add value to your property as well as looking fantastic. With these, you also get the advantage of being able to add fans to the ceiling to make your outdoor area a true all-weather destination. Alternatively, you can create much-needed shade with a pergola, a glide-and-slide mechanism or a good old-fashioned parasol. These days garden parasols come in all kinds of different shapes and sizes and can provide a cost-effective and versatile solution to your shading needs. If you more or less live outdoors and your budget and space allows, why not transform part of your Perth Patio into a show-stopping outdoor kitchen where you can entertain family and friends all year round as well as cooking your day-to-day meals? If this isn’t for you, there are other stylish ways of incorporating your outdoor cooking into your patios space. Too often, gas barbies are simply parked on our patio space as an afterthought, so why not put some thought into choosing and positioning your barbie to best suit the layout of your patio? Or why not try something a little different with a pizza oven? These are always a big hit with kids and teens and when family and friends come round for dinner. There’s no place like home and we only truly create that feeling when we add the final flourishes that are personal to us. Outside spaces are no different, so once you’ve sorted your basic layout it’s time to add the unique stamp of your character to your patio. You might choose an outdoor speaker system so you can enjoy your favourite music as you relax in your downtime. Or how about some outdoor rugs, throws and cushions to bring the cosy feel of the indoors outside on cooler evenings? Choosing great-quality outdoor glasses and plates is also a great way to make alfresco dining seem like a special event. Or why not treat yourself to a talking-point item like a hammock to while away those lazy Sunday mornings with a coffee and the newspaper? Outdoor-friendly artwork is also a great way to make a statement within your outdoor space. Or why not invest in some vases to create floral displays to bring the best of the indoors outside? Whatever you decide, there are countless ways to make your patio everyone’s favourite place to be at your house. Platinum Outdoors can assist you if you call us on 0402 144 093 today. Not everyone is lucky enough to enjoy balmy weather and sunshine all year round. But if you live in Western Australia, you’re spoilt with a wonderful climate that you just can’t get enough of. It’s hardly surprising that homeowners want to make the most of the 300 sunshine filled days in the year by extending their outdoor space with an alfresco patio in Perth. A cleverly designed alfresco patio blurs the line between indoor and outdoor spaces and can provide an intimate place to chillout in after a tough day’s work, for entertaining or just getting to be closer to nature. But there’s a lot more to outdoor patios than just being an extension of your home. As one of the leading alfresco builders in Perth, Platinum Outdoors can help identify numerous reasons to get one installed. Below are just six of the best advantages of having a patio. After a tiring day at work, there is nothing like coming home to your humble dwelling to unwind and pop your feet up. In a day and age where we are busy rushing around juggling a career, family, and a busy social life, finding time to completely relax is paramount. An outdoor patio can provide the space to give you much needed rest and relaxation, allowing you to enjoy the fresh air and be in nature right on your doorstep. You can even take the design of the outdoor space further by adding a decking where you could practice yoga or even meditate. Fortunately, the weather in Perth is great for outdoor living for the vast majority of the year. But when the weather is not so favourable – be it due to the harsh blazing sun or the odd bout of rainfall – you can still make use of an alfresco patio with some clever designing. You may want to consider how you can introduce shade into the outdoor design to create a sheltered space. Design ideas could include installing a full plasterboard ceiling if the patio is adjacent to your home. You may even want to take the outdoor patio spirit to another level by growing vines or creepers to provide shade for future years. By making these small design decisions, you can ensure the patio area will be in use all year round. A great advantage of installing a patio to your dwelling is that it provides a great place to entertain. This is particularly useful for homeowners who have smaller houses. 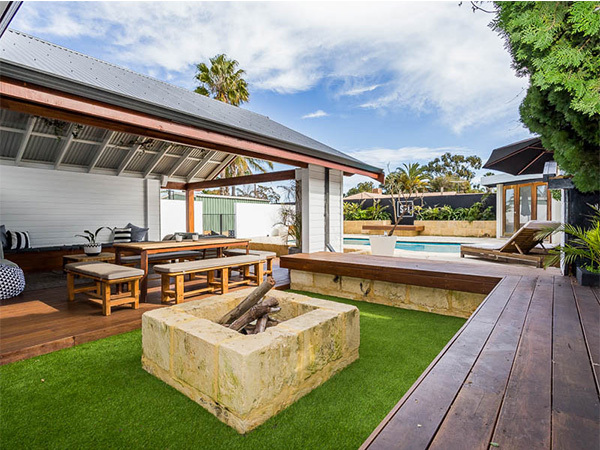 A well-designed outdoor living area in Perth can help make that barbecue, a family or friend’s get-together, or a social gathering with your friends far more enjoyable. It can be argued that the entertainment factor of an alfresco patio is one of the top reasons as to why people consider having them installed in the first place. And you can make that place as swanky as you want depending on your budget. 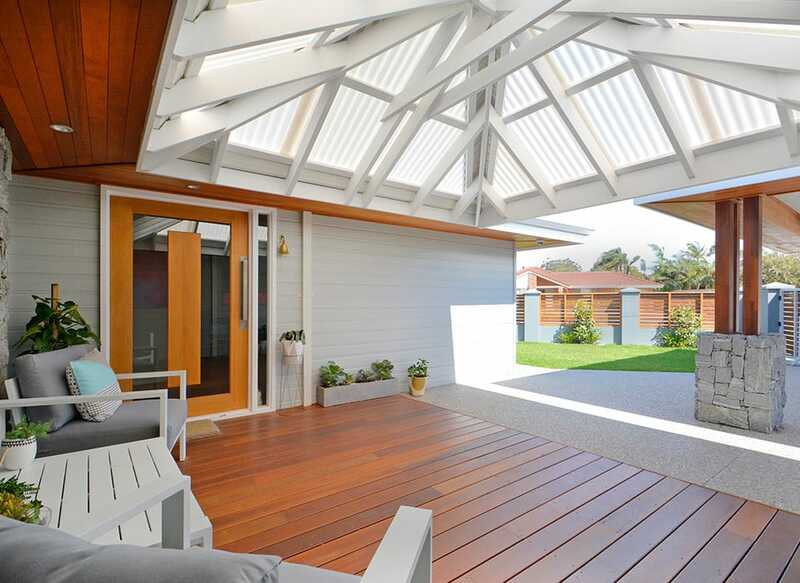 As Perth’s premier outdoor living and Alfresco builder, Platinum Outdoors can incorporate your timber or steel frame patio with lighting, a ceiling, specialised floor coverings, and even an outdoor kitchen. In addition to an outdoor patio, they can even have timber decking installed in your garden to make the most of the outdoors. A well-designed and well-built deck will provide you with the perfect place to spend as much time as possible in the great outdoors. Entertainment aside, installing a well-designed alfresco patio area will no doubt boost the value of your home. Depending on the current value of your property, adding a patio can considerably boost the valuation of your home by a good few thousand dollars. Estate agents are often heard saying that when people are considering buying or renting a home, the exclusion or inclusion of an entertainment area like an outdoor patio can seriously make or break the sale. Installing an outdoor patio can have a huge impact on your physical and mental well-being. There’s ample research to reveal nature can reduce our stress levels as well as reduce anger and fear. Being in nature or even viewing scenes of nature will help increase pleasant feelings. Exposure to nature not only helps with emotional health but physical as well. It contributes by reducing blood pressure, heart rate, muscle tension and the production of stress hormones. Luckily as humans, most choose a natural setting to retreat to when stressed. Therefore, a pleasing environment like a good outdoor patio on your own doorstep can do wonders for your general health all round. With a covered outdoor patio, you don’t have to worry about the harsh Perth sun fading and warping your furniture or the prospect of rain ruining those pumped up cushions. Besides it will save a lot of time scrambling around to put away the furniture each time it rains or the weather turns. Another benefit of a covered patio is that it provides vital protection from heat and UV rays. Unlike a traditional pergola, which lacks an awning, a covered patio will protect you from the sun and keep you a lot cooler. With Western Australia’s balmy climate and excellent sun exposure all year round, it’s little wonder that so many people choose to incorporate an alfresco patio into their Perth home design. As stylish as they are practical, a well thought out alfresco patio blurs the lines between indoor and outdoor spaces and allows you to make the most of our city’s wonderful climate. Whether you want to build a space for throwing lavish dinner parties or are more interested in creating an intimate outdoor nook to relax in after a hard day’s work, Platinum Outdoors is here to help you create an alfresco suited to your lifestyle, budget and the existing stylings of your home. Looking for some inspiration? As one of the leading alfresco builders in Perth, we have extensive experience in designing and implementing beautiful alfresco spaces, and we want to use this article as an opportunity to share some of our insights with you. Here are seven of the most important things you should consider to get the most out of your Perth alfresco. The key factor in creating a beautiful and functional alfresco is to plan your design around maximising indoor-outdoor flow. There are many ways of achieving this depending on your unique circumstances. For example, being mindful of your layout, keeping floor heights cohesive, reducing barriers between spaces and opting for materials that complement the overall aesthetic of your home can all play a role in smoothing out the transition from indoors to outdoors. For more inspiration, talk to the friendly Platinum Outdoors team, who will be more than happy to guide you in the right direction. While Perth is undoubtedly blessed with a fantastic climate, there’s no denying that the sun can be harsh, particularly during the summer months. With this in mind, you’ll want to consider how you can introduce shade into your alfresco design in order to create a comfortable and sheltered space. If your alfresco area is directly adjacent to your home, you may decide to go with a full plasterboard ceiling, but depending on the positioning of your patio that may not always be a viable option. Instead, consider timber or aluminium battening topped with a simple shade cloth. In addition, to really embrace the outdoor spirit, consider growing vines or creepers, or strategically planting a tree to provide shade in the years ahead. There are a lot of creative opportunities to use glass in your alfresco. For instance, if your alfresco is raised, you may need to fence sections of it off to comply with building codes. In contrast to conventional fencing, which tends to obliterate your views and create barriers between your home and outdoor spaces, glass balustrades are excellent for capturing and extending the sense of freedom an alfresco provides. As an added bonus, they also provide a decent level of protection from the wind. Just about any designer will tell you that the most important aspect of great ambience lies in the lighting. With this in mind, don’t neglect your lighting options during the design phase of your Perth alfresco. In the interests of creating a cosy and relaxing space, avoid going for overly bright, harsh lights that you might use in your main home. Dimmable LED lights are an excellent choice if you need good illumination in certain areas (such as an outdoor kitchen), while wall lighting is ideal for producing warm and welcoming tones – perfect for entertaining guests or relaxing after dinner. One or two well positioned spotlights can be used effectively to create drama and bring attention to notable features in your garden. Outdoor kitchens are becoming increasingly popular in Perth, and it’s easy to see why. Few things compare to cooking up a meal for the family in a casual outdoor space that has all the modern conveniences of a fully equipped indoor kitchen. However, it is important that you keep your alfresco kitchen as practical as possible. This means including adequate bench space for preparing meals, using materials that are easy to clean and maintain, and positioning your outdoor kitchen so that it’s within easy access to the house. You’ll also need to think about whether your outdoor kitchen needs to be able to power appliances. If space is at a premium, you may not have the luxury of getting creative with your seating, but if size permits we highly recommend including a variety of seating options in your patio space. Why? Simply put, it’s nice to have options. Chairs at a dining table are great if you’re sitting down to dinner or entertaining guests, while an outdoor lounger is sublime if you’re looking for something to sprawl out and relax in. Built-in benches that double as storage or railings are a great choice if you want to make more efficient use of the space. Just because you’re extending your home outdoors doesn’t mean you have to sacrifice your privacy. The position of your build will probably have the biggest impact on your privacy, but you can further shelter your alfresco with trees, plants, and tasteful timber screens. Try to find the balance that allows you to attain a sense of privacy without feeling like you’re boxing yourself in from the outside world. If you’re thinking about building an outdoor space, we’d love to hear from you. As one of the leading alfresco builders in Perth, we have extensive experience in building beautiful patios and can provide you with the expertise and friendly support you need to create a truly fantastic outdoor area. Get in touch with us today for a no-obligation chat about your project and find out more about your options. Can an Attractive Outdoor Area Add Value to Your Home in Perth? In a part of the world where the summers are warm and dry, and the winters are often very mild, outdoor living is, not surprisingly, a big part of the local lifestyle. In fact, many Perth homeowners place as much importance on the outside areas of their properties as they do on the inside areas, so the simple answer to the question in the title of this article is yes, an attractive outdoor area can indeed add real value to a home in Western Australia’s capital city. However, exactly how much value you are likely to add by developing an attractive outdoor area on your property will depend on the features you include in your plans and how well the whole project is executed. Professional Plans Are Essential – Whatever features you decide to include in your outdoor area, you will need an outdoor building specialist such as ourselves to produce accurate plans if you wish to ensure the finished result is everything you dreamed it would be, with an overall theme that ties each individual element together beautifully. At Platinum Outdoors, we have a great deal of experience planning and executing outdoor home improvement projects and are aware of all the factors that need to be included at the planning stage. Central Entertainment/Relaxation Space – Whether you go for timber decking, a natural stone patio or a custom-designed, covered alfresco living area, your new outdoor area should include a central space with seating and tables, where you can relax and enjoy the fine weather on summer evenings and long weekends. The ideal dimensions for this space will depend on how much land you have available for your project and whether you would like to use your new space purely for family relaxation or for holding lavish parties as well. Sympathetic Landscaping – To make sure that the outdoor area complements the rest of your home and is practical too, it will need to be professionally landscaped by a team of experts with many years of experience working on residential properties. Perimeter landscaping that both improves the appearance of your outdoor space and the security of your home is just one example of how a professional team can ensure your new area adds real value to your home. Council Permits – If you would like to avoid the possibility of having to tear down your alfresco living space or timber decking shortly after it has been completed, you should hire a company that can take care of any permits you may require, before the building work commences. If you wish to maximise potential ROI and ensure that your new outdoor area enables you and your family to enjoy the fine weather to the full during the summer months, call Platinum Outdoors today to discuss your requirements in detail.